Map Update Jan 07, 2013 : new ! can samsung galaxy sl use this? yes. since papago m9 support the resolution of galaxy sl which is 480 x 800 pixels, then, papago m9 can be use for galaxy sl. Look at the supported screen resolutin above for more info. how do you install the map? 2nd, Extract both files using winrar or 7zip. Find and copy NaviSEA folder and paste it in your sd_card if u use android version 2.1/2.2/2.3. If u use ICS, paste the NaviSEA folder in your external_sd. Note: no need to download Malaysia map from above link because it's already in the zip files [Part 1 and 2] you just downloaded. My mistake. I will update the post but not tonight cause too tired now. its not working on samsung galaxy mini it said resolution not supported... but the screen resolution stated there... what to do??? Sorry if the problem still occur cause i dont test this papago m9 on galaxy mini. I only test this gps navigation on galaxy w and galaxy s2 (my friend's phone) since I only have galaxy w.
Tell me if the apk working or not. Sorry, cant help you bcause i dont know what cause the error "kernel loading failed" . Try to use custom kernel/rom. I dont know if it's helps solve the problem or not, but you can try. sorry again. Thats all I can help you with. Hunter, do you having recalculation problem with your galaxy w? What apk file do you used? yes.. i have the same problem. Papago M9 got route recalcultion, quite fast and effective on my SGS3. How did you do that? Because recalculation doesnt work on my SGW. I still cant figure out what is the problem that cause this. I don't know, all are default configuration, never change any setting. Tested in my trip to Penang, very fast. dear Hunter , i just done installation on my new galaxy s3 , its work .but cant be full screen . any idea ? this problem can be solve ? sorry but papago m9 still not support 720p resolution. you might want to try this apk files, but i cant guarentee u it's working..
as i said, papago m9 still does not support 720p res. 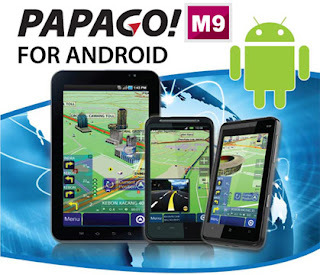 but, i heard rumors that papago m9 will have an update that will support 720p soon. i dont know if the rumors are true or fake but if true, i will update this post with new apk file..
what version of android u use? gingerbread or ICS? Its saying the same thing.. error can not open maps. The thing is.. there are no maps in the maps folder as well. Is this normal or do I need to do something differently? 2ndly.. I can just copy the navisea folder anywhere on the external storage or is there a specific folder? NaviSEA folder is the map for papago. links still alive and working..
internal sd card means sd_card. to make this easy, connect your phone to ur computer and it will display two card (sd_card and external_sd)..
but remember to paste it on the right card. This NaviSEA folder no need to paste on any specific folder, just paste it in the right card based on ur android version. the maps is up to date or not? just to update, i already install on my Samsung Galaxy Nexus. - First, there is no map included in your files. I check your NavSea/Maps folder is empty. So i download the map separately from MFM website. Just update the post. Malaysia map is now can download from the link in the post. But you need to have an account first. If you read others comment before, papago m9 still dont support 720p res. But i heard rumors that papago will update their app to support 720p res. If there is a new apk update for papago m9 that support 720p,i will update this post again. Hunter, any idea why the auto re-route calculation is not working like the earlier version once you are off route, need to manually set it? I am using Galaxy S2 with latest mfm map (http://www.malfreemaps.com/viewtopic.php?f=48&t=12943)and been using the apk from NaviSea, AlternateCrack and some of the link show above but non is working. After GPS was found and I select my destination, the arrow or the starting point will be in an totally unknown area without any landmark there until I use 2D zoom out till max and found out I've been so far away from my current location. Anyone facing this problem? maybe gps signal lost for a moment.. if u see satelite dish icon at the top right of the app, that means gps signal lost.. so, u need to wait for seconds/minutes for ur phone to lock the gps signal..
Im facing the same problem too with galaxy nexus. Anybody knows whats wrong? Make sure you guys OFF the mobile network. Thats all. No data network, then everything works charms! Hi Hunter, I also exprienced the same problem "cannot open maps" for my SGS 3, I put the NaviSEA under the ext SD. ICS ? if ICS, means you already put the NaviSEA folder the right card which is external_sd. I think this "cannot open maps" problem maybe cause you not extract the malaysia map. Anyway, Thanks for your effort. well, papago m9 will have an update soon to support 720p. I followed the steps to install in my Galaxy S3 but it cannot run. I have the error "Unfortunately, Navitotal! has stopped". I tried all the apk above but not successful. Can you confirm if your Galaxy S3 has the same version as mine above? Appreciate any advise to get Papago running in my Galaxy S3. it works on my friend's samsung S3 Ics 4.0.4, install in internal memory, works great but not in full screen, check your map folder. If there is no luck, try to use custom rom. you might get lucky. Sorry, how to install in internal memory? i ve downloaded both part 1 and part 2. so both part 1 and 2 has naviSEA file in each file. So do we need to put both navisea in the sd-card file? No. You need to extract part 1 so that, the part 1 and part 2 of the zip files combine together and extracted NaviSEA folder. Then, extract the downloaded zip file(Malaysia Map) in NaviSEA/maps folder. nope. if i start m9 amd select navi, i am at my crrent location and when i select my destination, the problem starts to happen and my gps is already lock that time. is there any my current location button? if there is, click on it, it should bring u to ur current location. or, try to use simulation by go to routing > function > simulation..
the simulation should start from ur current location and end at ur selected destination point. need help.. Im using HTC ONE X and there is no external storage... how to install this software? put the NaviSEA folder in internal storage (sd_card)..
thx. :) installed it.. is there any update for it to support full screen? installed and it's working nicely.... but sometimes it's seem lagging..
works fine for me.. no lag at all on stock rom.. I install in my ICS Tablet PC ( China Tablet PC) , once try to run M9 , it pop up "Unfortunately, Navitotal has stopped " . i dont know why this problem happens. Try to clear data by going to Setting > Application > manage applications > find navitotal > click force close and then click clear data. If it's not working, maybe cause it have some problems with your current rom.. Try to use others custom rom. unfortunately i have the same problem with my samsung S3:( "Unfortunately, Navitotal has stopped " . Km La, manage to solve the problem ? I encounter the same problem like you. Hi, Just wanna say thanks for posting this useful post for Papago M9 , I have been searching for this for quite some time . Installed according to instructions and It worked out fine, without any lag whatsoever on galaxy sl I9003. and also on galaxy tab 10.1 .
:) keep up the good work. Hi. I installed the apk on my galaxy s3. Tried to launch it but "papago has stopped unfortunately ". Need help pls. Try to clear data by going to Setting > Application > manage applications > find navitotal > click force close and then click clear data(The path maybe different on ICS). If it's not working, maybe cause it have some problems with your current rom.. Try to use others custom rom. Tell me if it's working or not. i try install to my galaxy tab 7+ but can't working..the navisea must be put in external storage or internel storage in galaxy tab 7+..can explain to me? how to combine part 1 & 2 ?? you can use 7zip. you can download it from here: http://filehippo.com/software/archiving/ ..
choose ur windows version(32-bit or 64-bit) and download it. Make sure you place part 1 and 2 at same folder. Right click on part 1 and hover at 7-zip and choose extract here. after extract part 1 what should i do? i cannot use the papgo at my galaxy tab7+..every time i on M9 the application Navitotal(process com.mactiontech.M8SEA)has stopped unexpectedly.Please try again is display on my screen..Why can fix this? try to use stock rom or other custom rom..
i install on stock rom and it works fine for me. usually, it conflict with your current rom. How to turn off/disable the PAPAGO vibration? hi guys,did you get charged by some sms services when starting/installing papago? there is no sms services when installing papago. no sms sent or receive during starting or installing papago..
PEOPLE, ONE OF THE APKs HAS A TROJAN! I do not know which one, but I suspect it is the 7Mb M9 v1.01 apk file. If you install this APK, it will silently send a subscription SMS to those paid SMS services at RM5/SMS. Hunter, I do not know if you are the author of this malware, but if you got this file from somewhere else and you really have no ill-intention, I strongly suggest you check all the APKs for malware. If you are the author, well, you are quite smart, I give you that. there is no trojan in the APKs dude..
every APK files is clean from virus.. I don't think antivirus able to scan this type of trojan. It is just additional of 1 or 2 lines into the program. Well. It works fine on my phone and still no damage since I first install this. Do I need to uninstall previous X5 after I install M9? no need to uninstall X5 after install M9..
you can use both of them if you want..
How do i make the display for the M9 as full screen in my galaxy S3? papago m9 still does not support 720p res. but papago will update m9 to support 720p soon. Did you manage to get it to work in galaxy S3? Is it supported for Android 4.0.4 version? thanks for sharing, i tried to install in the galaxy w, it works perfectly. but when i go to the setting of papago, i can't see the text, is it bugs? anything i need to set for it? no text? means only icons is displayed? follow instrunctions. work fine on S3 but not full screen. sambung tab 10.1 can use meh ? I found a solution where disable the network data seem to solve the problem. But do we have a permanent fix for this? well.. maybe the solution is to disable data while using papago m9..
Just disable data while using this app. Moreover, it can longer battery life because data use lots of battery life. Yup, agreed but good to have a choice where we can enable the data while using Papago M9. However no complain as I can use this lovely GPS, thanks Hunter . well.. try to use droidwall..
You're great. I am using Galaxy S2 ICS, can I put NaviSEA in internal sdcard instead of external? Pls advise. Thanks! I installed in my S2 ICS internal sdcard, so far no problem found. well.. just put the NaviSEA folder into internal..
i dont know why have to put NaviSEA folder into internal in S2..
this papago using money for using that gps??? i use it if need to search satelit...need open "use packet data"
No, Papago doesn't require data connection when using... It uses offline maps which u've already downloaded. The answer is no.. you dont need money or a working internet connection to use GPS or PapagoM9..
GPS does not require money or a working internet connection to work. GPS use satellite signal which come from satellites. 1. when i extracted the Papago M9 part 1 & 2 (each 194,560 kb & 70,923 kb) using winrar, the output files are (3 files) : H-S@GeMpak.OrgG which is only 3 kb, More download url less than 1 kb and Readme first also less than 1 kb, does it make sense....? Go to "H-S@GeMpak.OrgG" folder and there should be a "Papago M9! for Android" folder in that folder. In the "Papago M9! for Android" folder, you should find NaviSEA folder there.. Doesn't work on my S3. Tried to install from internal memory and SD card, both way failed. "Kernel loading failed. Restart again"
"Unfortunately, Navitotal ! has stopped working"
try to read above comments..
maybe there is a solution you can find for these problems. I have exactly the same problem in my Galaxy S3. Hunter, I tried all the steps above, but still failed. I copied the NaviSEA to both internal and external card, but still failed. thank you for the post. Great help. weird, ive install it can run but the interface got no text display. i cannot see the POI text but only icon. dont know why this prob happens..
How do I install the Singapore map? I am in Singapore but the apps says my current location is at KL. I downloaded the file MFM-PPG-X8.5-X9-120503.rar but how do I use it? Any help will be great. Thank you. extract the file [MFM-PPG-X8.5-X9-120503.rar] in NaviSEA/maps folder. After you extract, you should see lots of files in the NaviSEA/maps folder. Then copy NaviSEA folder to your sd_card or external_sd. no text at all!no road name oso! try to zoom in and zoom out.. In setting they're also empty text. I've re-download n re-extract both zip files and re-install Navitotal. the rar files work fine..
just right click on part 1 and extract..
try to read comments above. me too dont know why this problem happen.. Custom ROM ? Means have to root the android ? it does support s3 but it's not full screen in s3 because it's still not support 720p res. you dont need to root to flash custom rom. you just need to install Clockworkmod (CWM) first then download a custom rom for your phone, then flash it using CWM. it is able to stat up the papago M9, but somehow, it unable to detect my current location, its like keeps detecting somewhere around PAHANG and the map go blank. try to install gps test (you can find it on play store). make sure your gps is fully locked your current location in gps test. Hi Hunter, tried others post all fail, finally tried your Post, it works like charm. !00% perfect, thanks mate. will this gps work in samsung galaxy w ... ? hi, i had installed X5 in my samsung sl i9003 and always force close (v2.3.6) tried install m9 and hv problem when navigate...map gone missing or background is blank. can view my location and map earlier b4 click on navigate. after that can't load map at all. any idea how to fix this? make sure that there are lots of file in NaviSEA/maps folder..
because if you see nothing in that folder, that means there is no map installed. I have a problem after installed this application.. It says that "The application Navitotal! (process com.mactiontech.M8SEA) has stopped unexpectedly. Please try again." and there is one button below that and it says "Force Close".. How to fix this?? I installed this program to a Samsung Galaxy Tablet 7 Plus..
im sorry. i dont really know how to fix this..
2. Use other apk file from the post above. 3. Use a custom rom. does it works on asus transformer prime? is it a MUST to copy navisea folder into external sdcard (tp runs on ICS 4.0.3) or is there any way that i can copy to internal storage? yes. the resolution is supported. I think it's not a must to copy navisea folder into external sd. Some people say that m9 also could work if we put navisea folder in internal sd running ICS. You can try it for yourself. Worth a try. I have installed in internal sd,it works :). Btw,the link provided for the malaysia map is it the latest update? it's not the latest I think. about a month or two month ago..
anyway, i will find and update to the latest map soon. quite busy now.. so, I just have time to reply to comments..
btw thanks hunter! good job! Just wondering, can i put more than one set of map into same internal SD card? Thanks. I dont know if it's working or not. Never try it. But, if you try it, let me know if it's working or not. can this software support galaxy w?? I hope you dont mind if I copy this file and Put it in the post. I saw some had changed to 1196x720 & 720x1184. hunter , 720x1280 means can support my s3 ? I need resolution for htc one x.. anyone can help? Thank you for sharing these applications. It works great at my Samsung Note. I would like to know for htc desire hd can run from run from external memory or must run on internal memory space? can anyone help? I still have a DHD with android 4.0.4. M9 can run from the external memory without any problem. bro after i installed when i run M9 it says error: cannot open map. Do u kno wat went wrong? mind telling me ur steps how u install it in ur dhd? All links are alive. Papago M9 software is uploaded in Jumbofiles since mediafire deleted my files from their server. Just click on the link and wait 5 seconds. Then click Skip ads at top right. Can support for xperia neo v dat using ics 4.0.4 ? No. It's not a must. It works fine in stock rom. But, Papago M9 doesnt work fine in stock rom in some phones. So, using custom rom is a way to 'maybe' fix this problem. my sgs2 ICS say 'can not open map'..why? ?i already put NeviSEA in external_SD..and i've extract the maps in maps folder.. Put NaviSEA folder in internal sd. 2.Make sure you uninstall completely other papago version (x5 or x8). 3.After uninstall x5 or x8, install M9 again. This maybe conflit with other papago version. i had install the M9, can open the navigation, can see the menu. but i cant read any words in the menu. I found generic files for S3 and One X, you may download from links below. Just download and extract it (replace if asked) into the NaviSEA folder. It works great in my S3. Cheers! i've papago m9 in my galaxy w but it say unsupported resolution 0x0 why? thanks for the 1280 x 720 files! works perfectly in my galaxy S3 (ICS 4.0.4). must put all the files in sdcard though, not extSdCard. After installed in my Htc desire hd it says error: can not oepn map. wat went wrong pls help me hunter. after i installed when i try to open it, it shows papago X5 and then says tat can not open map. do i need to remove my papago x 5? Are we getting a full screen after download the link below? Yes. Works great on mine. Using Samsung S2. Works fine. TQ!! Can xperia x8 that had been upgraded to ICS 4.0.4 use this? i was looking for this in ages. thx bro..